We have two Catholic albums: the first adds 25 popular Catholic hymns to our wider range, while the second has 27 Marian hymns. 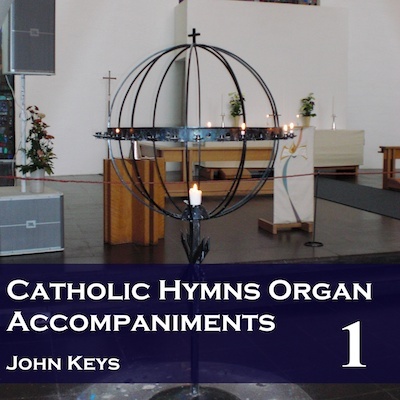 You may also be interested in our Core albums, including 138 popular traditional hymns, and the US Anglican Supplement, which includes 96 hymns, many of which are also used in Catholic churches in the UK as well as the US. There are no voices on these recordings, just a playover and the accompaniment. The CDs can be bought online here. Alternatively, you can drop us an email at info@cul.co.uk with your order requirements and we will send back an invoice with the bank details to make a bank transfer, or send a cheque for the appropriate amount made out to Creativity Unleashed Limited to Creativity Unleashed Limited, 31 Eastbury Way, Swindon SN25 2EL, or buy using a card over the phone on 0117-230-7123 (Cheques and purchases over the phone in pounds sterling drawn on UK bank accounts only). If you have any queries about the CDs or how to buy them, please drop us an email. We send your CDs first class in the UK or airmail overseas. Email us or call on 0117-230-7123 if you need UK special delivery. All prices include post and packing. Any or all of the tracks for these albums can also be download from Amazon and iTunes, or both Catholic albums together can be downloaded directly from us. To download both albums from us, use the Buy Now button here. For individual tracks or the whole album from Amazon/iTunes see the Hymns included section below. Please note the album cover shown is for our online album only. The CD has a different cover.